The Designs Act of 1842 created 13 classes of ornamental designs, including glass, which was class 3. 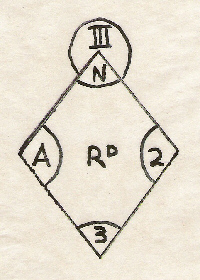 Items whose design was registered at the Patent Office Design Registry are marked with a registration diamond, where the letters and figures identity the class of product, the year month and day of registration, and the parcel number. The diamond, on those items which are marked, can be found on the inside surface of the item. The name of the firm which registered the design can be found by looking up these details in the registers held by the Patent Office. In the first period, the year letter is at the top, month on the left, day on the right, and the parcel number at the bottom. Thus the example reads 2nd Dec 1864. 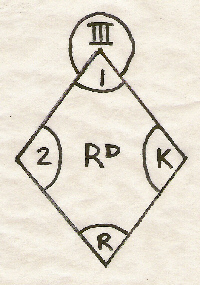 In the second period, the year is on the right, month at the bottom, day at the top, and the parcel number on the left. 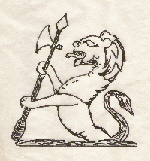 Thus the second example reads 1st Aug 1883. After 1883 design registrations are numbered in a single sequence. 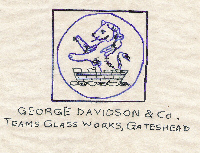 Thus the first glass design registered under the new system is number 675 on the 23rd January 1884 (an ink bottle by Kemp & Taylor of Manchester). These numbers (like the registration diamonds) are usually to be found raised from the inside surface of the article. EG Rd 82606 is Moore’s “Daisies” suite, registered on 30th Sept 1887. 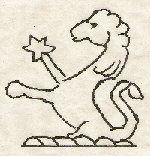 Instead of (and sometimes as well as) registration marks and diamonds, some firms marked their goods with the company registration mark. 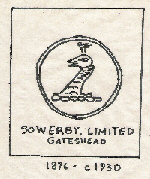 Examples of these marks, which are most commonly found, are those of Davidson, Greener, Sowerby and John Derbyshire. Like other registrations, they are usually found on the inside surface of the article. Information taken from: Jenny Thompson “The identification of English pressed glass”.